The auction features Property from the Estate of Patrick Swayze, star of Dirty Dancing, Point Break, Road House and Ghost, who was quite a real cowboy in his personal life. Property includes items from Swayze’s personal and professional life including highlights: Patrick Swayze’s leather jacket from the film Dirty Dancing (Estimate: $4,000-$6,000); his shirt and shoes from the iconic film Ghost (Estimate: $2,000-$4,000); Patrick Swayze’s Golden Globe nomination certificate (Estimate: $800-$1,200); a collection of script packets from Season 16 of Saturday Night Live when Swayze hosted (Estimate: $600-$800); a Patrick Swayze Point Break worn O’Neill wetsuit (Estimate: $2,000-$4,000); a Point Break film used surfboard (Estimate: $4,000-$6,000) and his Point Break skydiving gear (Estimate: $1,000-$2,000). 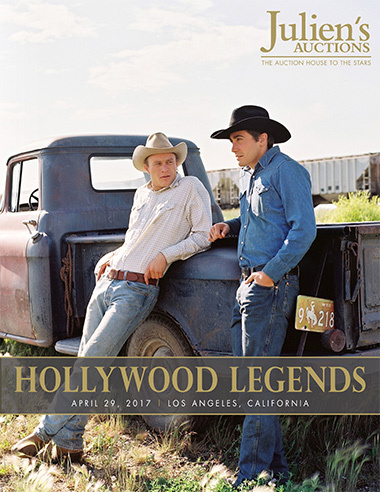 Cowboy genre items included in the auction are from Heath Ledger and Jake Gyllenhaal’s wardrobe worn in the 2005 Oscar winning film Brokeback Mountain. These costume pieces are being offered for the first time and are accompanied by production photographs taken on set of the stars in the ensembles. ($4,000-$20,000). John Travolta’s Urban Cowboy Western shirts are also vying for toughest costume on the auction block ($800-$4,000), as are Rambo III prop knives custom designed to Sylvester Stallone’s personal specifications. Also featured is the King of Cool, Steve McQueen, whose 1972 Honda motorcycle ($50,000-$70,000) along with his 1969 racing jacket ($40,000-60,000), top them all. Doris Roberts became everyone’s Mom in her portrayal of Marie on Everyone Loves Raymond. But Roberts’ life was far more complicated and interesting as evidenced by the Property from her Estate. From friendships with some of the greatest authors of our time to her outstanding art collection and beautiful costume jewelry, it is obvious that comedy was only a small part of Roberts’ legacy. Other highlights in this auction include: a platinum blonde wig worn by Marilyn Monroe as Roslyn Taber in her final 1961 completed film The Misfits (Estimate: $20,000-$40,000); a Marilyn Monroe personal vanity case ($1,500-$2,500); a selection of items from the career of Barbra Streisand including her Funny Girl (1968) traveling jacket (Estimate: $2,000-$4,000); a gown worn by Barbra Streisand as Fanny Brice in Funny Girl (Estimate: $2,000-$4,000); and Daniel Craig’s James Bond dinner suit designed by Tom Ford for Spectre (2015), with the embroidered label sewn into the interior pocket that reads “Tom Ford/Daniel Craig/Bond 24” (Estimate: $50,000-$60,000). 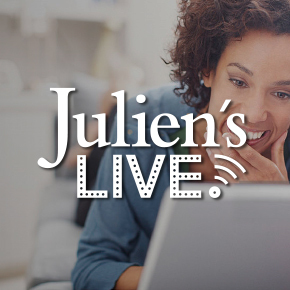 Join Julien’s as we celebrate the depth and breadth of the lives and career of Hollywood’s brightest and most legendary stars on April 28 and 29, 2017 at the 2017 Hollywood Legends Auction.